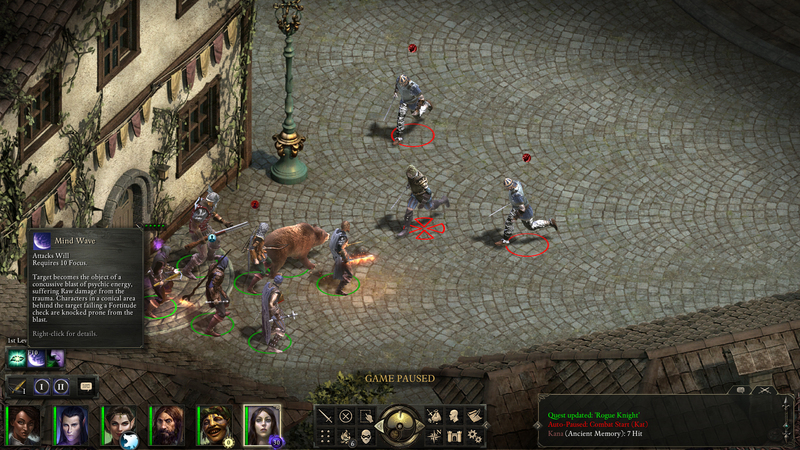 Pillars of Eternity evokes the halcyon days of isometric RPGs. 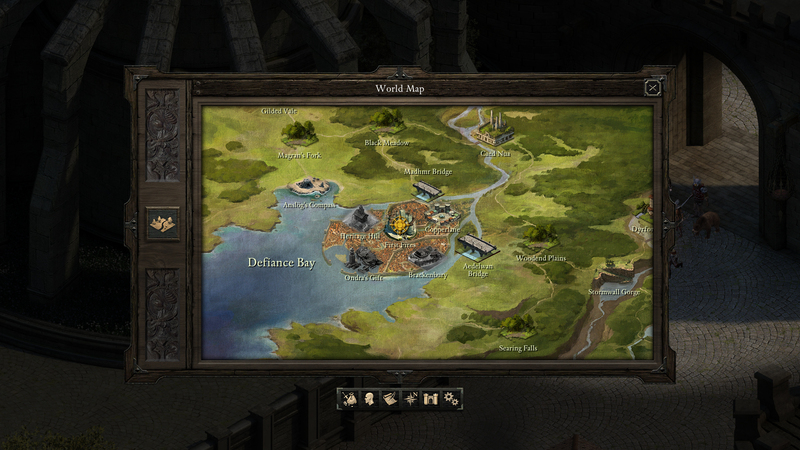 Editor's note: Our review of Pillars of Eternity is now complete. You can find our score and our final thoughts on Page 2. For even more in-depth analysis, check out Axe of the Blood God — our official RPG podcast. If you want to glimpse the roots of well-known RPGs like Fallout and Dragon Age, you need only look toward Pillars of Eternity — a kind of living time capsule for '90s PC RPGs. Based on the Infinity Engine RPGs of the late '90s, Pillars of Eternity evokes Baldur's Gate, Icewind Dale, and Planescape Torment — all franchises Obsidian worked on back when they were still known as Black Isle Studios. For Obsidian, returning to that style is like coming home. They've made some great RPGs over the years, but Infinity Engine RPGs continue to be right in their wheelhouse. Oh Infinity Engine, how we've missed you. "Pillars of Eternity was something we knew we could do, and we knew that... you knew... we could do," director Josh Sawyer told me when I previewed Pillars of Eternity last July. "We could pitch an Infinity Engine-style game made by the people who did Neverwinter, Temple of Elemental Evil, and Planescape and have people say, 'Yeah, I think you can do that." Not surprisingly, despite technically being an original offering by Obsidian, Pillars of Eternity feels a great deal like the Dungeons & Dragons-based RPGs of old. Its rules are reminiscent of those in D&D 4th Edition, with some being available on a per encounter basis, and others only available after resting. As a result, properly rationing camping supplies is a big part of the strategy in Pillars of Eternity. The flow of the combat should likewise be familiar to longtime PC RPG fans. When an encounter begins, the action pauses so that you can distribute orders to your party, at which point you can un-pause and watch the mayhem begin. Which is not to say that you can brute force your way through encounters. Pillars of Eternity kicks up the difficulty quite early, and if you're not careful, you can find yourself losing your squishy spellcasters early on and being quickly overwhelmed. It's hard enough, in fact, that Obsidian actually recommends that most people start on Easy, with Normal being reserved for veteran fans of the genre. Character creation determines not just your individual strengths, but how NPCs will react to you. While occasionally frustrating, though, Pillars of Eternity's world is compelling enough that I've wanted to keep pressing onward. In true D&D fashion, it allows you to paint your own canvas to some extent, with many of the interactions being based on the race, background, and gender that you choose when rolling your character. It doesn't take long for the story to get rolling in earnest, with your character being imbued with the mysterious ability to gain insight into a stranger's past, making them a "Watcher." 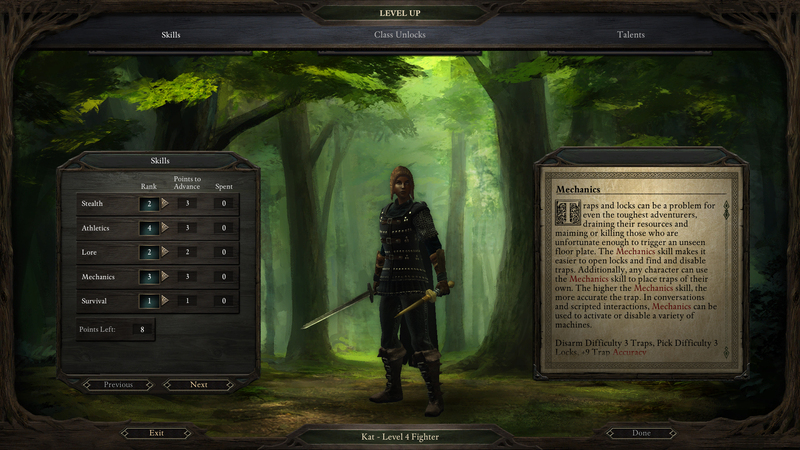 The thing I like most about Pillars of Eternity thus far is how expansive it all feels. It isn't long before you reach Defiance Bay — a multi-part city that almost feels like it could be the setting for a game by itself, like Midgar in Final Fantasy VII or Kirkwall in Dragon Age II, but set in a much larger world. You also get your own fortress relatively early on, though unlike in Dragon Age: Inquisition, it's up to you to invest in building it up from scratch. Doing so confers benefits like unlocking bounties and attracting new heroes to your cause. It's a really interesting game, and thus far, I have few complaints about its execution. The biggest problem I've had thus far has been with a game-breaking bug that I encountered late in Act 1. Playing as a Ranger, my wolf companion unexpectedly disappeared, and I found myself unable to go up stairs. It was bad enough that I actually had to start an entirely new game, which is why I'm only in Act 2 at the moment. Something to remember if you decide to roll up a Ranger. Outside of that (admittedly rather large) quibble, I find myself intrigued by Pillars of Eternity. As someone who didn't really get into that style of RPG until the release of Dragon Age: Origins — itself a somewhat gimped Baldur's Gate — it's been interesting to go back to the heyday of isometric RPGs. It's a big world out there. Let's jump right in. Tagged with infinity engine,	obsidian,	pillars of eternity,	Reviews,	USgamer. Well, except for Cities: Skylines on Xbox One, since that already came out.